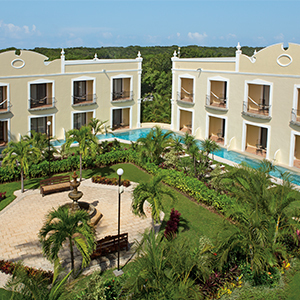 Discover the All-New Dreams Tulum! New swim-out rooms & suites! Dreams Tulum Resort & Spa, one of our secluded beach-front resorts in the Riviera Maya, is surrounded by mesmerizing gardens and greenery, a sugary white-sand beach and the deep blue Caribbean Sea. With 432 elegantly appointed rooms & suites, nine gourmet international restaurants, seven festive bars & lounges, two shimmering swimming pools, endless daytime activities & nightly entertainment, and a Mayan-themed Explorer’s Club for kids – Dreams Tulum is the perfect getaway for you and your family! The all-new Dreams Tulum Resort & Spa showcases newly redesigned rooms & suites with contemporary Mexican decor and luxurious new furnishings, along with various restaurants and bars that have been given a fresh new look. Beautiful swim-out room sections are also brand new, and a section of those rooms are now reserved for adults only! Watch our new resort commercial – you’ll see why you need to book your next family vacation at Dreams Tulum! Don’t forget to stay connected with us on social media! This entry was posted in Dreams Tulum and tagged Dreams Tulum, family vacation, Tulum. Bookmark the permalink.